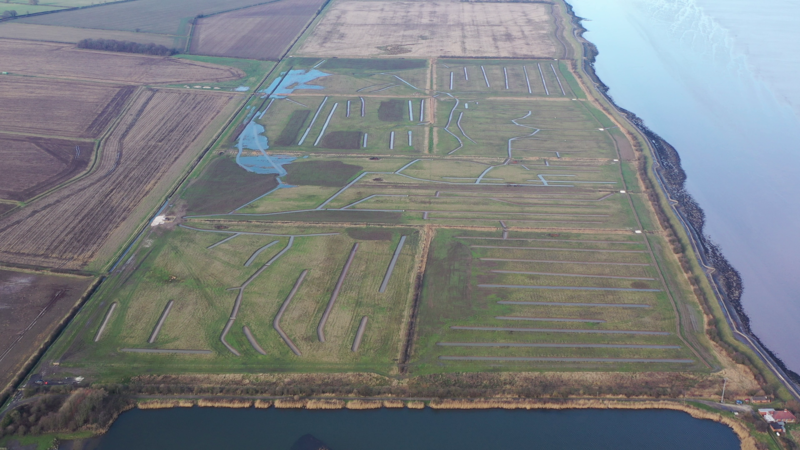 The image above (22 January 2019) shows the first phase of managed mitigation land for the Able Logistics Park development, located on the South Humber Bank. The ecological mitigation covers an area of 90 hectares (222 acres) and provides a specially engineered wet grassland habitat for the benefit of a range of bird species including Curlew, Golden Plover, Lapwing and Ruff. The mitigation is required to compensate for the lost habitat by the species defined within the Special Protection Area (SPA) in accordance with Article 4 of the European Commission’s Birds Directive (2009/147/EC) which, for the Humber Estuary, came in to force in 2007. The works, undertaken in-house, commenced last spring.